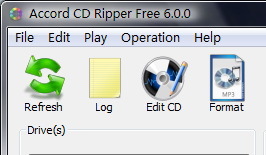 Exclusive secure CD ripping modes for perfect digital audio extraction. Rip CD to MP3, FLAC, M4A and other dozens of audio formats. Rip to more advanced & efficient codec like ABR MP3, VBR MP3 etc. Seamlessly works together with user provided encoders. Rip multiple CDs simultaneously. More flexible output mode: split, merge tracks, rip sector section, user-defined output pattern. ...... during the ripping process. It can convert CD tracks to MP3, WAV, OGG, WMA files. Qweas is providing links to Accord CD Ripper 6.8.9 as a courtesy, and makes no representations regarding Accord CD Ripper or any other applications or any information related thereto. Any questions, complaints or claims regarding this application Accord CD Ripper 6.8.9 must be directed to the appropriate software vendor. You may click the publisher link of Accord CD Ripper on the top of this page to get more details about the vendor.